Headset leader teams with Canadian retailer to market industry-leading BlueParrott Bluetooth products across Canada. VXi Corporation is teaming with Canadian retailer Visions Electronics to market its industry-leading BlueParrott Bluetooth products across Canada. It gives our BlueParrott brand a significantly larger retail presence across western Canada—and gives Canadian mobile professionals easier access to the headsets that are #1 with truckers everywhere. VXi Corporation today announced a new retail partnership with Visions Electronics in Canada. Visions Electronics will carry the entire line of VXi’s BlueParrott Bluetooth® headsets at its 32 stores across Canada. VXi BlueParrott is the acknowledged leader in Bluetooth headsets for road warriors and mobile professionals. Vastly superior sound quality and noise canceling, combined with roadworthy reliability has made BlueParrott the headset choice of truck drivers and mobile professionals everywhere. The programmable VXi BlueParrott B350-XT, for example, delivers the unsurpassed audio that BlueParrott is famous for, plus an array of advanced technologies like its customizable Parrott Button™ that users can program on the go to perform an array of functions. For fans of a smaller form factor, the extendable-boom VXi BlueParrott Reveal™ gives users the noise-canceling flexibility they need in any environment. The most recent addition to the BlueParrot line is the Point™, the sound choice for crystal-clear sound in a super-small package. 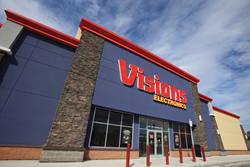 With retail locations in all major markets in Manitoba, Saskatchewan, Alberta and British Columbia, Visions Electronics is dedicated to being recognized as the Best Name in Electronics in Canada. In addition to its retail operations, Visions Electronics services the wholesale market with Visions Business Solutions, and ships products all across Canada via its website, visions.ca.